Some guys just don’t know when to leave well enough alone. Stephen King just wasn’t satisfied with the work that other directors did with his stories. He had to write and direct last year’s Maximum Overdrive. It was one bad movie, and not even a nifty soundtrack by AC/DC could save it. Now along comes Clive Barker, a 33-year-old playwright/author/artist from Liverpool, whom King describes as “the future name in horror fiction.” With Hellraiser, Barker has taken his own first shot at directing–with about the same lowly results as King. Both authors can scare the bejesus out of you with the written word (see Barker’s Books of Blood or The Damnation Game), but put them behind a camera and the only nightmares you get are those concerning the six bucks you wasted at the theatre. 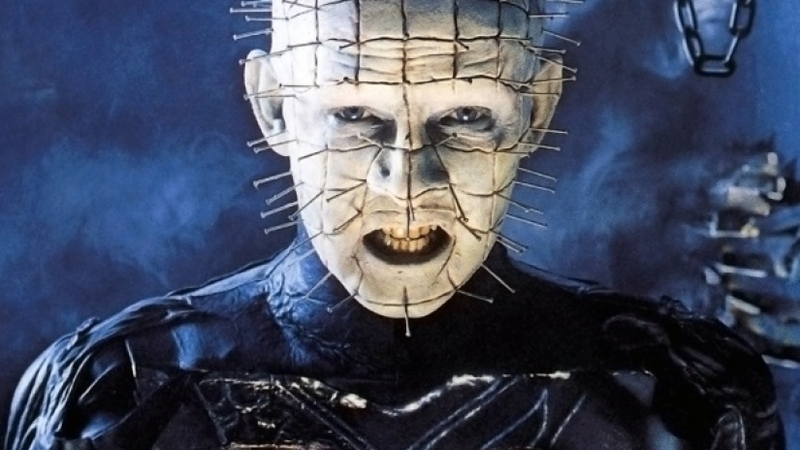 Hellraiser (originally titled Sadomasochists from Beyond the Grave) starts when American Larry Cotton (Andrew Robinson, the sniveling psycho who made Clint Eastwood’s day in Dirty Harry) moves into a home in London, England, with his British wife Julia (Clare Higgins). They discover that one of the upstairs room has been occupied by persons unknown, and Larry soon realizes the tenant had been his brother Frank. Julie’s passion for her husband begins to dissolve in the face of domestic boredom, and her thoughts turn increasingly to Frank (Sean Chapman), with whom she had a brief tryst. The room he lived in has an oppressive aura, and when Larry tears open his hand while moving a mattress up the stairs, the room’s floorboards absorb the blood like J-cloth. This plasma appetizer brings about the resurrection of Frank, who has been reduced to a gooey, skinless corpse by four demons called Cenobites. Frank raised the Cenobites from the outer reaches of hell by solving a Chinese puzzle box, and the only way he can become whole again is by feeding on human blood. Julia, excited by her lover’s return, agrees to supply the victims. From this point on Hellraiser gets sillier and sillier, as Barker concentrates on painting the screen red with blood and gore. There are some intriguing special effects in the movie, but a limp script and unconvincing performances don’t help. Worse of all, it isn’t scary. I only jumped once during the entire film.